Moringa is used in many parts of Africa and Asia not only as a medicinal plant, but also as a food (staple diet and dietary supplements). Nearly all components of the tree can be eaten. 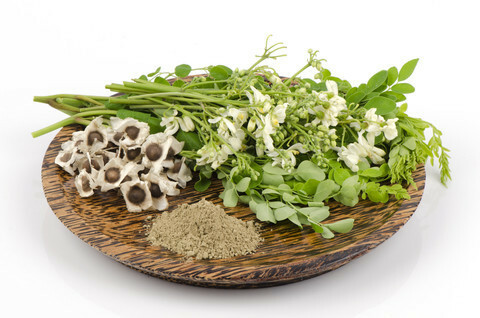 The Moringa leaves are equipped with a green "treasure", which is absolutely unique as food for the supply of vital substances and as herbal medicine. In the countries of origin they are eaten raw, leafy vegetables such as boiled or cooked in a pan at a vegetable curry. The sheets and the powder produced therefrom are also suitable for the tea that resembles that of the Brennnesseltees from the taste. It is especially rich in minerals, phytochemicals and antioxidants. In the first 2 years a tree sheds around 80-90 fruits. If the tree is fully grown, the fruits are of 25 - 70 cm and in some cases even more than 90 cm long. Due to its slim design, and because they are woody, aged, they are also called drumsticks (drumsticks). 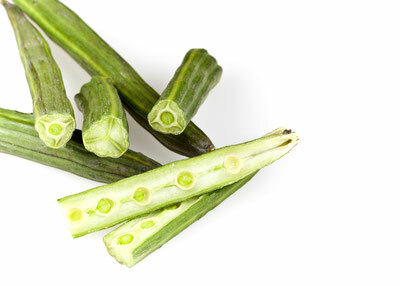 In southern countries they are used in fresh form as a staple food. The mature fruit contains 12 to a maximum of 35 seeds with an average weight of 0.3 grams. They are light brown to dark brown and embedded in 3 paper-like white wings. The seeds can be eaten roasted or boiled raw and have antimicrobial and anti-inflammatory properties. Studies have shown that they, among others in arthritis are effective. 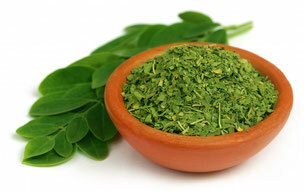 Moringa seed extracts may also help to keep unpopular microorganisms and pests at bay. Positive was the effect, for example, tested at rumen microorganisms that consume up to 30% of dietary protein and are therefore suppressed in agriculture by formaldehyde or antibiotics. After the University of Hohenheim stood at an optimization possibly a substitute for feeding antibiotics available. Skin Protective effect: According to Dr. Hans Lautenschläger the positively charged ions of the proteins of the seeds have a lotus effect, which helps to reduce pollution of the skin (Source: Cosmetic International 2007 (3), 72-76). Skin-damaging particles such as dust, fumes, cigarette smoke, soot, pollen or urban particulate pollution are loaded predominantly positive. Since the Moringa proteins have the same charge, these harmful particles may much less stick to the skin due to the repellent effect. This property is exploited also in hair care products. The 2 to 3 cm large petals that bloom over a period of 3 months, are white to creamy-white and can be brewed for tea. This has a mood enhancing, stimulating and invigorating effect. The nectar is anti-inflammatory. Local beekeepers use it for the production of Moringa honey. The oil portion of the seeds is up to about 35%. 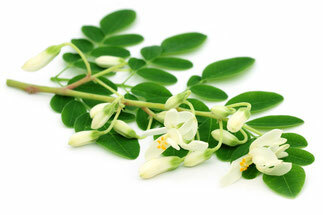 This precious oil is also known under the name Behenöl, Benöl or Moringa oil. It has a share of monounsaturated oleic acid (omega-9 fatty acid) of 70% and thus a similar fatty acid composition as the olive oil. The color is pale yellow to -braun and pleasant taste characteristic and mild. The oil was already appreciated by the ancient Romans and Greeks, and was in Egypt, the most commonly used for medicinal purposes vegetable oil. Even today containers are obtained with this oil from this period. What distinguishes the Moringa oil is its very high oxidation stability. After the Rancimat test, in which the oil was exposed to an air stream of 100 ° C, these are more than 80 hours. In the cosmetics sector, it is therefore used as a stable, but effective lipid basis for hair, soap and skin care products. The oleic acid (72.5%, C 18: 1) softens the skin and promotes the permeability of the skin for other skin active ingredients (penetration enhancer). The palmitic acid (6.2%, C 16: 0) and stearic acid (5.3%, C 18: 0) are important components of the skin's outer layer (stratum corneum, stratum corneum) and protect it from negative environmental influences. The behenic (5.7% C 22: 0) ensures a more solid consistency and prevents the production of free radicals that age the skin faster. "But what is modern referred to as anti-aging, was 3500 years ago in Fashion. To eliminate the wrinkles on the face, Ebers Papyrus recommended:. You rub fine incense, wax, fresh Behenöl and Cyprus grass, give the mixture to mucilage and treat it every day to the face. Do it, and you'll see the success. " The remaining oil press cake has properties similar to the seeds and can be used for water treatment as a soil conditioner or fertilizer. Another possible application that is being investigated is the use as a high-protein feed. Degreases the protein content is about 60% and feeding trials at the University of Hohenheim to lambs ran promising. In Africa and Asia, the bark and roots of the Moringa tree are used as a cure for various diseases. Thanks to the high amounts of mustard oil glycosides (glucosinolates) in the roots of these antibiotic properties, but also an abortifacient (abortifacient) effect at an appropriate concentration.